This is a prime lens manufactured by Canon and the model was launched 1987. 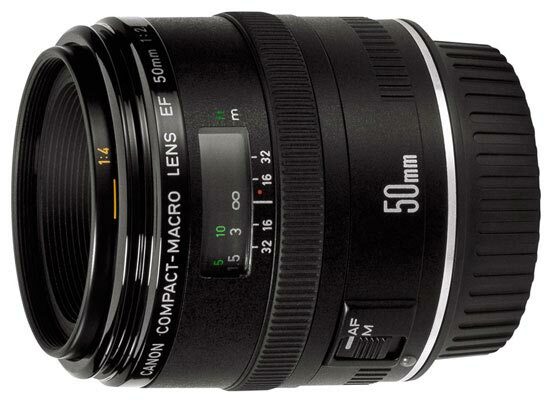 The lens has a focal length of 50 mm. Depending on which camera the lens is used, the experienced and perceived focal length will be different. Please visit the list of compatible cameras below, it will provide the equivalent focal length you get on each camera. The lens brightness and aperture value is f/2,5. As for the lens hood we at Lensora unfortunately have no facts or information whether a lens hood is included or not. Do you know more? Please contact us. Text from Canon: "A superior-performance lens offering excellent optics and focusing from infinity down to one-half life size (0.5x). Its nine-element design features a floating optical system, which ensures top-notch performance even at close focusing distances. Light and compact, it functions beautifully as a general-purpose normal lens. The optional accessory Life Size Converter EF enables focusing down to life size (1:1), and actually increases working distance - very desireable in close-up shooting.